He collaborates with the artist Emma Biggs to produce paintings. “Biggs and Collings are interested in something they have noticed by looking at art from the past. Art, as it used to be understood, has come to an end. But what strikes them is that old ideas and habits of mind are hard to shake off. Former ways of thinking constantly influence behaviour today. You could say that an example of this phenomenon is the way the aestheticisation of the art object has been replaced by the aestheticisation of the art experience. 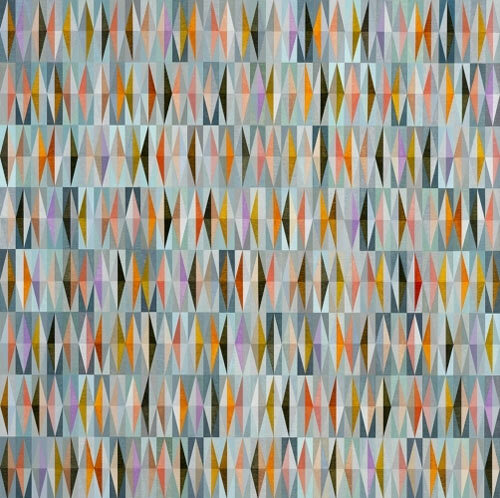 The thorny issue of how the past is present in what we, as a society, see and do, and the way in which it may differ from what we believe we say and do, is at the heart of Biggs’ and Collings’ work”. Matthew Collings :: This Is Modern Art. Episode 1 of six-part TV series written and presented by the English art critic Matthew Collings, in 1999 on Channel 4. Several images were shown to us throughout the presentation from Matthew Collings, of oil painting chequer board arrangements. As these were shown, Matthew pointed out that the painting has nothing but itself. It does not require to be talked about. This, I have found, is true for the majority of paintings and artworks in general. Nothing is required to be talked about, and yet we want to talk about it. Through this, you cannot dispose the implications of the question. Matthew also pointed out that it is not about the beauty but rather about the outside concept. Within the paintings, there is the ongoing onset of light and dark, much like a ticking clock, but then after that there is nothing regal. There are also, as Matthew said, lots of different configurations of all the colours. None of the triangles are the exact same colour, which create divisions. These divisions can mean different things, for example with the diamond in the square, but it does not have a meaning. The painting cannot force you to draw conclusions but invites you to realise that the peer is a disposition in the elements. This had been said as there were two artists working on this series of paintings. In some ways, Matthew found, they are more like designers rather than artists, just without function, which makes it artwork and makes them artists. There is also a certain perception via the colour relationships within the painting. There has to be this particular type of colour here because there is a particular type of colour there. The colours were not put down just because they are pretty. The technique that was used was little brushes and thick paint, creating a piece that looks like it was woven, or that it is a blanket or chalk on a dark ground or surface. All the activity that goes on throughout the painting are like objects revealed by the world. Matthew showed us the progression of one of the paintings that they worked on previously and it showed that there is no particular order to the work. The work is often filled up before it is finished as then it is adjusted, balanced and refined. The artist that he works with makes the colour and suggests where is should go, and then Matthew paints it on. They are not romantic or subjective artists and the point of painting are neither of these. Neither artist is interested in the narrative of these. Everything that you are doing is some kind of division or subdivision. Both artists are interested in mosaics and in particular, historical mosaics. They have worked in mosques, churches and cathedrals to help build and restore mosaics but also to learn mosaics. All their paintings have a title from the book of Genesis, the Bible. This is not a religious connotation but they are interested in the background of it as it informs and helps their artwork, as the Bible is part of the history of art. Matthew also commented that it is not just about the visual aspect of experience. The elements should be disposed about the place that is realistic. A unity enquiry. A balance enquiry. When exhibiting, the use of photos explains what they are doing but not quite inspiration to them. These photos come from everywhere; Florence to England, a painting to a reflection in the water. They also look at the very basic units of perception i.e. light and dark. In some works, sometimes the units has the triangles and the diamonds, but sometimes they are empty. Emptiness is then encountered by business. The paintings are also very roughly executed, but looking from a distance, they seem streamline. Throughout the pieces, there is a sense of perusing patterns. Do a type of art that is a metaphor for things but also of nothing at all because it is so abstract.